And it don’t stop: just this morning we’ve told you about an LES bar opening a Bushwick spin-off, an East Village pizza joint opening a Williamsburg offshoot, and now: a Williamsburg slice spot opening a new location in the LES. 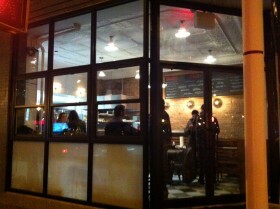 The dough is made in-house, with homemade yeast, by pizzaiolo Nino Coniglio, who’s a bit of a pizza stuntman. The mozzarella, whipped up twice daily, goes onto slices along with Parmigiano-Regiano and Pecorino Romano imported from Italy. Heroes, salads and sodas are also served. The 16-seat spot, outfitted with recycled wood and subway tiles, has what they’re calling a “stand-up gentleman’s counter,” but we’ll see how many gentlemen they get on the Lower East Side late at night. Hours are from noon to 11 p.m. Sunday through Wednesday and till 1 a.m. Thursday through Saturday.